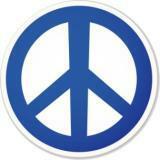 Many different cultures, religions, political movements and individuals have developed peace symbols over the years. Below you will find a selection of the most widely recognised ones. The illustrations are commonly known throughout the UK and beyond as representing peace, justice and non-violence. Each picture has a corresponding explanation of its possible origins and the means by which it has become associated with peace. See below for suggestions on how to use this resource. See our discussion pages for more topics of debate and learning. This resource can be used in a number of ways. Print off and use the symbols and the information as the basis of a display for a One World Week event. 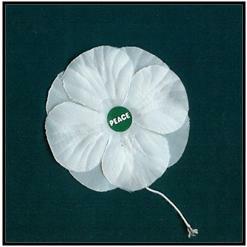 Download the full document and use it to start a discussion on peace and how certain symbols can have such emotive power in society. Click here for a complementary series of questions and discussion points for participants (Word 1997 59KB) and for facilitators - (word 1997 61.5KB). - For adults you might want to try providing people with the explanation of the symbol but without the image or the title. Participants have to search for the correct symbol and write down its name and location at the venue. Once all of them have been completed a prize could be allocated. The degree of difficulty can be adapted depending on where you hide the images, how much information you give the participants and whether or not you provide straight-forward or coded clues to help find the items. - For children you may want to hide the images throughout the venue, and tell children that they have to find them throughout the day. The children could have simple clues providing guidance on where to look, or just be told to keep their eyes open and stay alert! Depending on your resources you could have stamps or stickers that they collect on a sheet to demonstrate that they have been to that location. Print off this A4 grid of symbols to use as a deck of cards for playing pairs or snap. Stick the sheet to some card so that players can’t see the pictures through the paper, and then cut them out, shuffle, and get playing! Don’t forget there are lots of other games and activities on our resources pages!